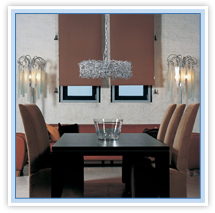 The Rolset company provides you with material roller-blinds..
All model of the Rolset roller-blinds use an Vegas innovative mechanism in their construction, reliable and solid roller-blind propelling mechanism, whose main feature distinguishing it from the competitive solution is the installation on the outer side of a roller-blind side plate and compact construction. Both the assembly as well as possible replacement and inspection of the roller-blind mechanism is made without any tools and lasts only a few seconds. Changing the side of a chain may be done as well easily. This unusual feature may save precious time and effort needed during roller-blind assembly, disassembly or maintenance. 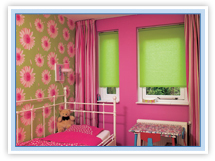 Additionally, the Vegas mechanism contains self-breaking system, which stops the roller-blind material in any place without the need of fastening or blocking the roller-blind chain. The roller-blind system, which is well-acknowledged among our clients, in an elegant, streamlined aluminium case equipped with the Vegas mechanism, assembled with screws to side-pane slat. Aluminium flat tracks glued to the side-pane slat with a foam tape overlap with the pane. An unusually cheap roller-blind system without a case with line lead, equipped with the Vegas mechanism, assembled with screws to the side-pane slat. 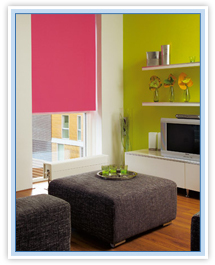 The line is under the roller-blind cloth, invisible after lowering the material. The system with an option of non-invasive assembly on metal hooks and with an option of line tension regulation with special adjusters. A roller-blind system in a capacious aluminium case equipped with the Vegas mechanism assembled with press studs with special aluminium adapters, glued to a window frame. The system may be assembled to and reassembled from a window many times without any tools, it breaks neither the window nor the roller-blind. Spatial aluminium track of C profile, glued to a side-pane slat with a foam tape, it does not overlap with the pane.